Mizuhiki are Japanese crafts made from tied washi (Japanese paper) and are tradiationally used as decorations for gift-wrapping. In Japanese culture, the word musubu (結ぶ), which means ‘to tie’, is not only used for wrapping, but can also evoke a sense of creating bonds between people. The exquisite shapes of handmade mizuhiki convey feelings of togetherness and warmth. In this workshop led by professional gift wrapper Yoshie Kumagai, you will explore the Japanese customs of gift-giving and omotenashi (spirit of hospitality) and have a chance to handcraft small mizuhiki decorations. In addition, you will learn how to write some kanji (Chinese characters) and Japanese expressions that communicate certain feelings. Finally, you will create a card/bookmark, decorated with your own handcrafted mizuhiki and a kanji of your own choosing – for yourself, or someone dear to you. This workshop will be conducted in English; no Japanese language ability is required. Yoshie is a professional gift wrapper certified by the Wrapping Association in Japan (ラッピング協会). 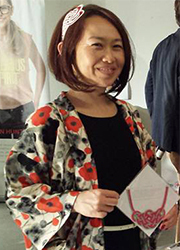 Combining her design skills and knowledge from Japan, she has been introducing and teaching furoshiki (fabric gift wrapping) techniques in Sydney since 2009. She has run mizuhiki workshops and performed furoshiki demonstrations in and around Sydney, including at the Art Gallery of New South Wales.